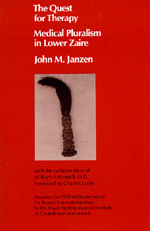 In this book, Dr. John M. Janzen describes patterns of healing among the BaKongo of Lower Zaire in Africa, who, like many peoples elsewhere, utilize cosmopolitan medicine alongside traditional healing practices. What criteria, he asks, determine the choice of the alternative therapies? And what is their institutional interrelationship? In seeking answers, he analyzes case histories and cultural contexts to explore what social transactions, decisionmaking, illness and therapy classifications, and resource allocations are used in the choice of therapy by the ill, their kinfolk, friends, asociates, and specialized practitioners. This book presents an "on the ground" ethnographic account of how medical clients of one region of Lower Zaire diagnose illness, select therapies, and evaluate treatments, a process we call "therapy management." The book is intended to clarify a phenomenon of which central African clients have long been cognizant, namely, that medical systems are used in combination. Our study is aimed primarily at readers interested in the practical issues of medical decision-making in an African country, the cultural content of symptoms, and the dynamics of medical pluralism, that is, the existence in a single society of differently designed and conceived medical systems. John M. Janzen is Professor of Anthropology at the University of Kansas. His books include Lemba 1650-1930 (1982) and Ngoma: Discourses of Healing in Central and Southern Africa (California, 1992).